I am monitoring the movements of Goose, the green sea turtle, very closely and am a bit concerned about the high surf. 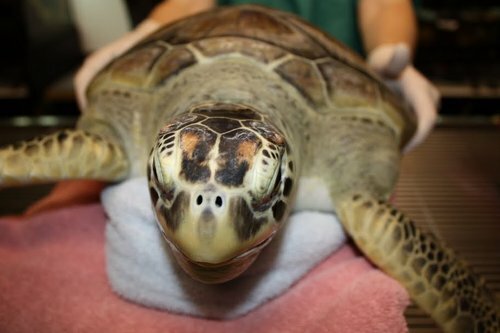 Of course these animals encounter high surf, storms and tides throughout their lives, however I am being extra cautious since this animal has been in a rehabilitation setting since November. I did not expect to receive as many hits from the tag due to the high surf but so far I am receiving the data. In the photo below you can see the antenna of the tag bending over after the force of a wave. During high surf and storms we often do not receive as much data because this antenna does not clear the top of the waves. As many of you know, the track of this little green turtle are posted on seaturtle.org. Goose is currently off the coast of Rhode Island oddly enough off the coast of Gooseberry Island! This event was so popular that even Spiderman took time out from his busy crime fighting schedule to watch the release! 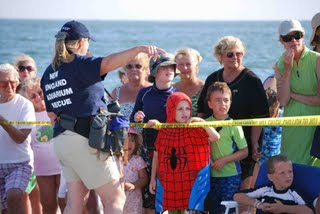 In the photo above, an Aquarium educator talk to the crowd while waiting for the animals to be brought down to the beach. This part of the release is called the "Walk of Fame." The turtles are removed from their transport boxes and walked around the outskirts of the release area. The crowd remains behind the caution tape, but is given a close view of these spectacular animals. After their 15 minutes of fame, the turtle handlers line up the animals on the beach and place them down at the same time. This year a friendly competition developed among the handlers and the crowd as to which turtle would enter the water first. The Audubon turtle won by a mile, and so did it's cheering section! After making their way down the beach, the turtles enter the big blue! I attached a satellite transmitter to the shell of a green sea turtle named Goose so I can see how well he does after rehabilitation. The tag will also provide data on where this animal goes, the surrounding water temperature, and the depth and duration of it's dives. You can follow the track of this turtle on seaturtle.org. I'll also proved updates on this blog. A turtle is prepared for tagging. Today we finished inconel tagging the five turtles that will be getting released (date and location is yet to be determined). Before being released, all of the turtles need PIT tags and inconel tags. We blogged previously about PIT tags here. Inconel tags are superalloys that are corrosion and oxidation resistant. Imprinted on the tags are distinct numbers that get reported to the Cooperative Marine Turtle Tagging Program. Both rear flippers are tagged. The area is cleaned with sterile scrubs in order to prevent any infection. This process is not painful for the turtle, and probably can best be described as the pinch you would feel if getting your ear pierced. We also numb the area with lidocaine prior to application, so there is little chance they will feel any discomfort. It is a very quick process, and the turtles are already back in their tanks swimming and don't even notice their new jewelry! So if these animals are found again, either on a beach nesting or by some other researcher, the numbers can be tracked and it will show that the turtle underwent rehabilitation here at the New England Aquarium. We also take measurements, photos, and a final weight of each turtle so we can track progression of the animal over the rehabilitation stay. Stay tuned for updates and photos of the release of these turtles. We are also planning on satellite tagging Goose to follow the exploits of this turtle out at sea. Three loggerhead sea turtles have recently been released from the Riverhead Foundation for Marine Research Preservation on Long Island, NY. These turtles started their rehabilitation here at the New England Aquarium back in November and December. 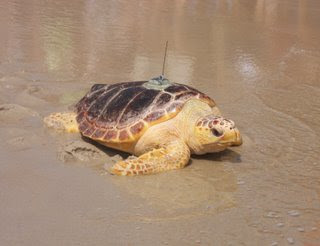 Junior was released on July 18th, Herb was released on July 25th and Jupiter, the smallest loggerhead of the Cape Cod 2008 cold-stun season, was released on July 28th. All three turtles were fitted with satellite tags and can be tracked. Here is the track for Junior, which Riverhead renamed Atlas. Here is the track for Herb. Here is the track for Jupiter. I have heard rumors that Santa, the last of the loggerheads that were sent to Riverhead, will be released very soon.